The blank thick foam can coolie has that “old school” style and feel and is a popular item for screen printing. This koozie measures 4″ (height) x 3.25″ (diameter) and the foam is about 3/8″ in thickness. The blank thick foam can coolie is semi-rigid and stands by itself. This regular size can cooler fits most 12 oz. cans and 16 oz. cans but it is a bit loose on beer bottles (neoprene can coolies fit beer bottle better than foam). The bottom of the koozie is fully enclosed with a glued in foam piece that features a vent hole in the bottom center so the can slides in easier. Wholesale discount pricing is available with cheaper pricing for larger bulk orders. 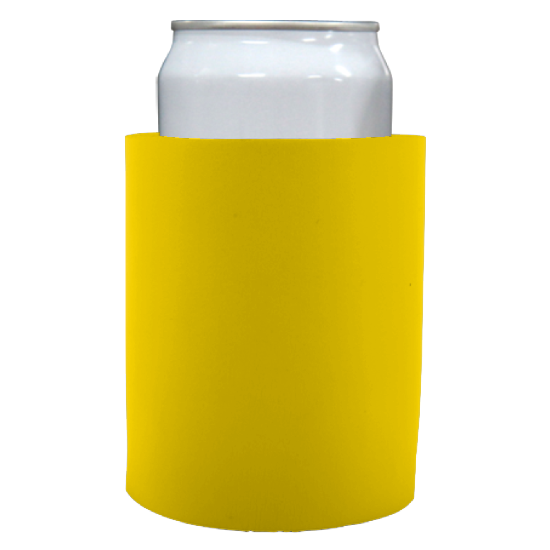 Several colors for blank thick foam can koozies are available including black, orange, burgundy, forest green, gray, yellow, pink, kelly green, lime green, fuchsia, navy blue, neon blue, purple, red, royal blue, teal, turquoise, burnt orange, gray and natural (off-white). Orders are typically shipped within 1 business day and delivery time will be 3-7 days depending on your location (lower USA shipping times). Standard shipping rates are based on order weight. You may also choose to get rush shipping at checkout for a bit more money. The blank thick foam can coolie is ideal for giveaways, weddings, promotions and business marketing because of the low prices and economical print options. Discounts for bigger orders allows you to get cheap prices no matter how many koozies you need. This coolie is a high-quality item, with nice thick walls for excellent insulation.